What would winter be like without Christmas? Martina and Karl, who like all other children look forward to Christmas all year round, discover exactly that in Meta l-Milied Ma Ġiex, the year when Christmas never came. He got out a crooked old trumpet and started blowing black bubbles, which got bigger and bigger until they covered the stars, the sky and all that was glittery and bright. The world was enveloped in darkness. No one felt like celebrating Christmas that Christmas Eve and everyone went to sleep early, dreaming black dreams. Martina and Karl woke up on Christmas Day to find their Christmas tree flopped against the wall, the light of their beloved crib completely off… and no presents! It had been so dark that Father Christmas could not find his way around! That Christmas Day, children all over the world woke up broken-hearted, but for the Man on the Moon it was the best Christmas ever. He simply could not stop laughing, and laughing, and laughing until his belly ached. And he kept laughing for months on end, and was so loud that Karl and Martina could hear him from their bedrooms. That year there was no Christmas. Come next winter, Karl and Martina were worried that the same thing would happen again, so they decided to write to the Man on the Moon. Very, but very, politely they asked him to help them, please, by making the moon shine so much so that this Christmas, Father Christmas would find his way to children’s houses. And what do you know? The Man on the Moon had never ever in his life received a letter. “These children thought of me! Hurrah, Hurrah!” He started jumping up and down with joy and nearly fell off the moon. Needless to say, Christmas was back that year: the light of the moon helped the carol singers sing their songs, and it lit up all the Christmas posters. Most of all, that special night was full of stars and the moon full of joy. Christmas was here to stay. 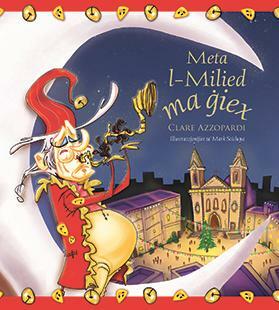 First published in 2008, Meta l-Milied Ma Ġiex was a huge success. It soon became a modern classic loved by all Maltese children, and sold out immediately. This year, on the book’s 10th anniversary, Merlin Publishers are issuing a new edition. Written by popular children’s author Clare Azzopardi, this is not a conventional Christmas tale, but rather it makes children think what winter would be like without the Christmas cheer, and appreciate it more. The tale is given life by Mark Scicluna’s illustrations which are grounded in a very typical local context for its Maltese readers.